SAN ANTONIO - As we head into a new school and workweek, it's only right to do a little review. Your weather team doesn't want you to be caught off-guard, you know? Sunday night: Fog, drizzle, and gloominess will continue. Some fog could become dense in spots. Temperatures will hover near 50 degrees for most of the night, slowly climbing into the low 50s through early Monday morning. Monday morning: Fog and drizzle will continue into the morning commute. It will be cloudy and humid. 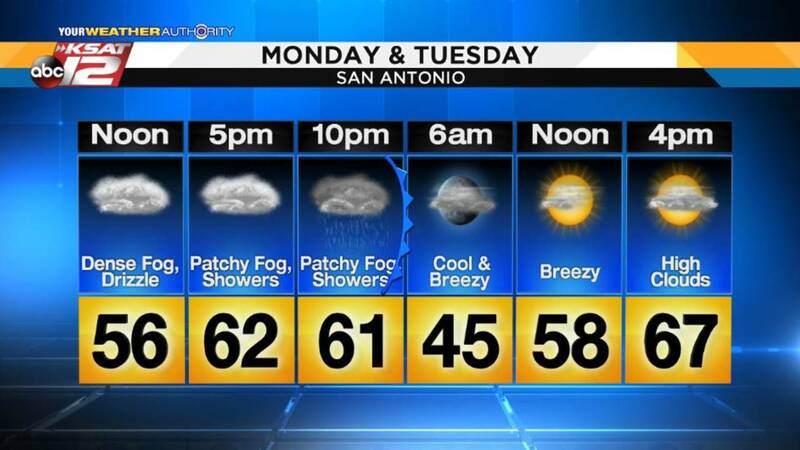 Monday afternoon: Fog will become less widespread through midday as temperatures climb into the upper 50s and low 60s. The morning drizzle will start to taper off a bit, too. However, light, passing showers will be possible throughout the afternoon. Monday evening: Light showers will continue, and skies will stay cloudy. Patchy fog will begin to redevelop, especially along and east of I-35. 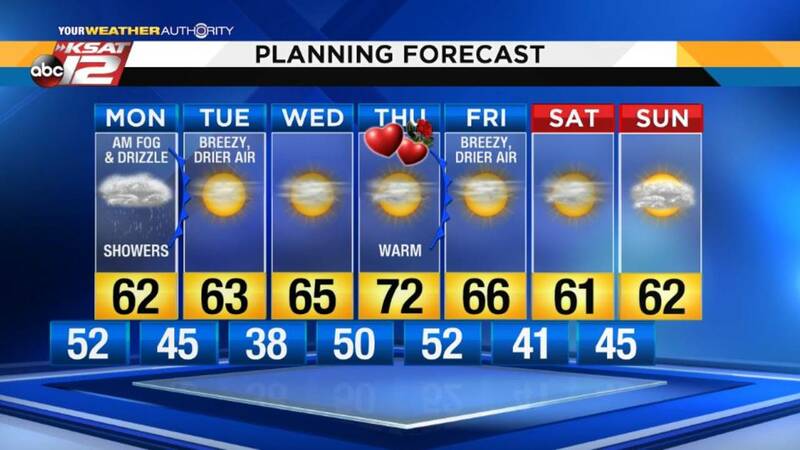 Temperatures will be in the low 60s. A cool front will be moving through the western Hill Country. 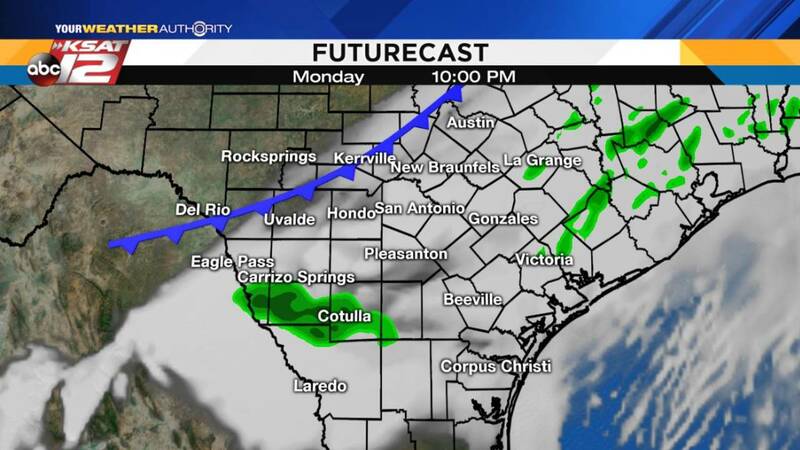 Monday night: That same cool front will move thorough the I-35 corridor and San Antonio around midnight. As it does, chances of rain will gradually drop off, and skies will begin to clear. Tuesday afternoon: Mostly sunny skies will stick with us all day Tuesday. High temperatures will be in the low to mid-60s with a breezy north wind. Drier air will be in place, too... No more fog! Tuesday night: Temperatures will drop into the upper 30s under mostly clear skies. Valentine's Day Sneak Peek: Skies will be mostly cloudy on Thursday, and it will be warm in the afternoon. For any evening plans you have, temperatures will be in the 60s. Rain is not in the forecast at this time.